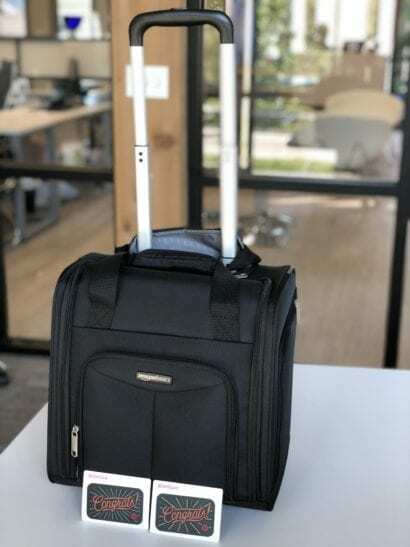 AmazonBasics Underseater Carry-on Giveaway Details! Home > Carry-on > AmazonBasics Underseater Carry-on Giveaway Details! 13 Jul AmazonBasics Underseater Carry-on Giveaway Details! We are currently running a giveaway on Instagram, and it’s not too late to enter! We are giving away an AmazonBasics underseater carry-on bag, in addition to $100 in Visa gift cards. Read below for rules & regulations, how to enter, and more details on the carry-on bag that we love and that YOU could win! Step 1: Follow @enchantedtravel_ on Instagram. Step 2: Like our post on this content. Step 3: Tag at least 2 friends in the comments. The winner will be chosen and announced on Wednesday, July 18th. Entry is open through end of day, Tuesday, July 17th. Want to know why we love this AmazonBasics underseater? Tell us what you think makes a bag the perfect carry-on by commenting on our Instagram post for this giveaway. We chose this bag as our #1 favorite for many reasons. First, we love a carry-on bag that can fit underneath the seat. The best part about this one is that it will fit under all airline seats, including the sometimes-smaller aisle spot, and economy seating. In fact, I recently flew from Omaha to Chicago on United in the economy section, in an aisle seat. As economy, we boarded the plane last. Normally this could be an issue with a carry-on because they may run out of overhead bins. Thankfully, I had my AmazonBasics underseater and I boarded the plane stress-free with all of my belongings within reach. So, what else do we love about this specific bag? One word: pockets. The creator of this AmazonBasics underseater thought of everything. There are two handy side-zip pockets for easy access to things like cell phones or bottled water. The front pocket area has handy sections for your wallet, passport, gum, etc. In addition, the inside is roomy enough for a few items of clothing and a jacket. Lastly, it comes with a detachable toiletry liner, so you can easily grab what you need to spruce up after the flight. So, what are you waiting for? Don’t forget to enter for your chance to win an AmazonBasics underseater carry-on for yourself. Enter by end of day Tuesday, July 17th, and the winner will be announced on Wednesday, July 18th. If you have any questions, feel free to reach out to us at 402-281-3022. Good luck!